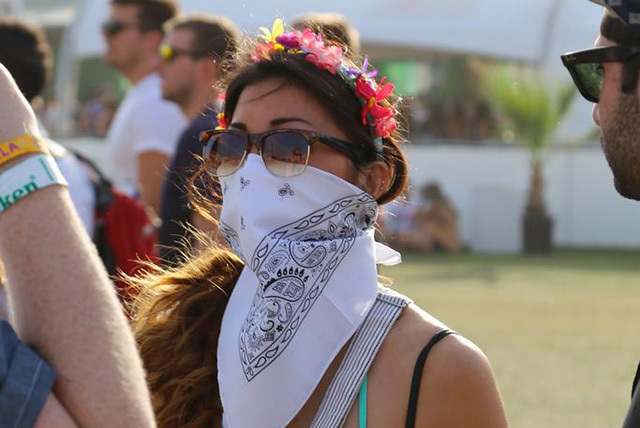 Angelenos heading inland today for weekend one of Coachella should brace themselves for high winds and a whole lot of dust. The National Weather Service issued a high wind warning for the Coachella Valley and surrounding regions, predicting that wind speeds could reach 35 miles per hour with possible 60 miles per hour gusts. The advisory also warned of blowing dust and sand, which could reduce visibility to less than one quarter mile at times. An inside source told LAist that the upper portion of the festival&apos;s main stage will be lowered if winds exceed a certain speed, which is standard protocol and not unique to this year&apos;s festival. Though every Coachella weekend is of course its own unique snowflake of an experience that can never be replicated—or even fully understood—by those who weren&apos;t out there on the polo field with you, we would be remiss in not mentioning the epic #windchella conditions of 2013 and 2014. The good news? It will be hot this weekend, but not brutally so. Temperatures on Saturday and Sunday are expected to top out at 90 and 92, respectively. According to the Desert Sun, music festival officials sent a notification to festival goers Thursday, reminding those who will be camping to secure their campsites and take the tops off pop-up tents. The advisory is expected to last until 11 a.m. Saturday. The National Weather Service has also warned of potentially hazardous travel conditions on the I-15 and I-10, along with Highways 111, 247 and 395. All hold-on-to-your-flower-crown-jokes aside, we at LAist would like to remind you that driving during a wind advisory can actually be pretty scary. Reduce your speed. Slowing down gives you better control over the vehicle and will give you more time to react in the event your vehicle gets hit by a strong gust of wind. Maintain a firm hand position on the steering wheel. Strong wind gusts are unpredictable, and if you are not holding the wheel properly, gusts can be strong enough to cause the steering wheel to be jerked out of your hands. Be alert. Look well ahead and watch for any debris on the road. High winds can cause debris to litter the highway or can even throw debris directly into your path. By looking ahead you give yourself more time to react to road hazards. Do not use cruise control. You can maintain maximum control of the gas pedal for when unpredictable gusts of wind occur. Be proactive. Wait for the storm to blow over. It may be safer to pull over and take a break.